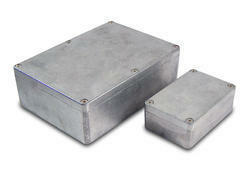 Pioneers in the industry, we offer metal boxes from India. The Sheet Metal Boxes offered by SRG International are designed using latest computer aided technologies and can also be tailored as per the drawings and specifications of our clients. Our exclusive gamut includes Electronic Wall Mount Boxes, Telephone Panel Boxesand Telephone Shelf Main Boxes, Enclosures, Cabinets, Box, Acoustic Panels, Acoustic Rooms, Generator Canopy.